A shower panel can really take your morning cleaning routine to the next level. Instead of just a basic shower head you get four different water outputs: a large shower head that creates a rainfall effect, a handheld showerhead for mobility and hard to reach places, 3 swiveling massage water jets and a tub filling water spout on the bottom. The panel has four knobs that control each function, and a master knob that controls water pressure and temperature. The fixtures are all made from brass with a chrome finish, and the unit is made from stainless steel. 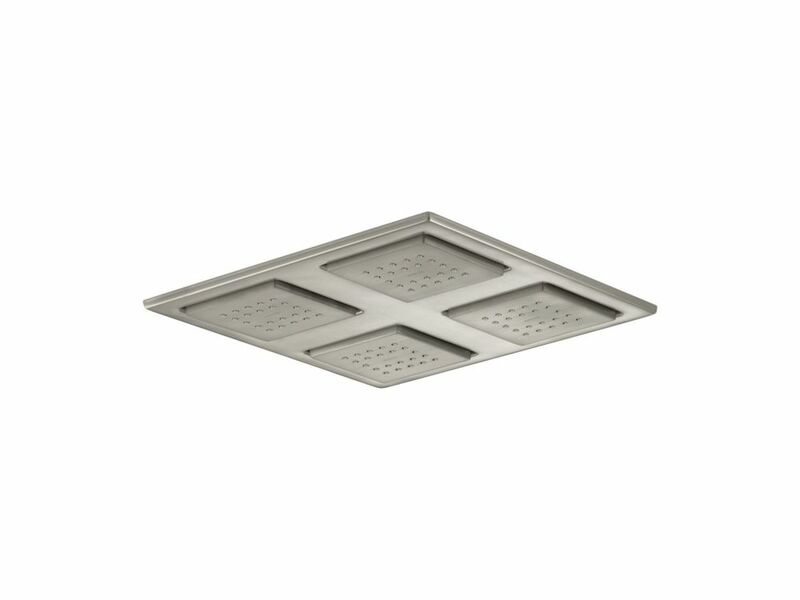 Watertile Rain Overhead Showering Panel In Vibrant Brushed Nickel With four 22-nozzle sprayheads, WaterTile Square Rain overhead showering panels provide luxurious water delivery that even Mother Nature would envy. Four fully adjustable and pivoting square sprayheads distribute a relaxing shower of water that simulates a gentle summer rain.